Trade your Dodge for a Volkswagen Truck? Would you trade your Dodge for a Volkswagen Truck? No. That is not a "truck". It's a unibody Ridgeline clone. If they put a diesel in it, there may be a small market for it. I'm sure it will come nowhere near the new Colorado in hauling/towing. It does come with a diesel. 120 odd horsepower, 300 ft/lbs in the bi-turbo flavor. Cargo capacity of just over 2600 pounds as well. Not too bad really...... but, no two speed transfer case. VW/Audi is one of the most unreliable makers out there, no way I would buy a truck from them. Is that why Volkswagen is poised to be the #1 auto manufacturer in the world? Poised to be the biggest automaker in terms of volume in the world.....just because you make a lot of things does not necessarily mean you are making the best. Your statement has merit; however, the percentage of vehicles VW manufactures with poor reliability pales in comparison to the rest of the lineup. Were that not the case, then Volkswagen would not be profitable enough to expand into other markets and thereby increase volume. The other factor in VWs favor is that VW has accomplished what almost every manufacturer has worked toward, for decades, which is a single platform shared by a majority of models it produces. Back to the unreliability statement -- if the vehicle was built in Germany (ie the Golf, New Beetle, or Jetta models) and imported to the US, reliability was not an issue; however, back when the New Beetle came out (circa 1998) the New Beetle and other models built in the Puebla plant had horrid reliability problems. Vehicles produced were so bad (for about four or five years) that dealers in the US would refuse vehicle deliveries if the cars on the truck originated from the Puebla plant. VW officials in Germany had had enough and ordered the plant shut down for 30 days and required every single employee to re-train and requalify for his position. Quality of the products produced increased dramatically (as expected). Agreed. I had a 64 bug when I was in college in the 80's. I drove the livin **** out of that thing, took it offroading, etc. I could not kill it. I hated it though cause of that dang 6 volt electrical system. At my part time job we had an 83 Rabbit diesel that we used for deliveries. I could usually get out and run faster than that thing when taking off from a stop...lol, but, it would never die either, no matter how hard us college kids tried. A friend of mine picked up a diesel Rabbit pickup that had under 70K miles and a 4-speed transmission (about 6 years ago). It was a complete dog in first and second, but once it went into third that thing took off like a raped ape. The newer turbo diesel injection setup is in almost every vehicle of VWs lineup and will plant both driver and passenger firmly in their seats from the word "GO". 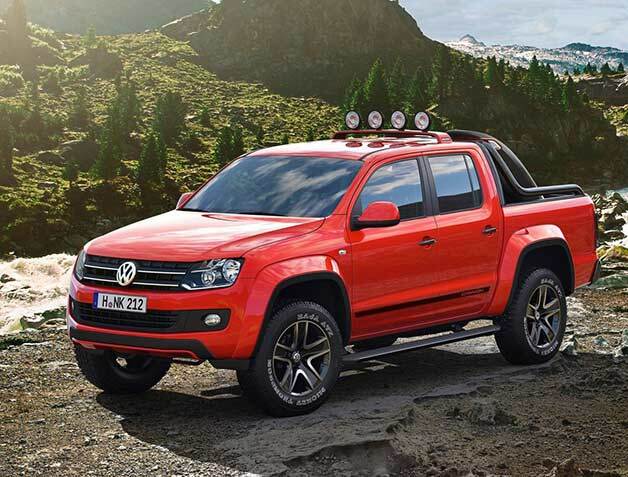 The Amarok is an interesting truck, but only in the smaller truck segment. And, like I said, it can be equipped with a diesel. Quick Reply: Trade your Dodge for a Volkswagen Truck?